In recent years, squirrel-proof feeders have gotten very good. Modern weight-sensitive models are extremely reliable at keeping out squirrels and are the simplest solution for protecting bird seed. A spring mechanism allows birds to feed while shutting out heavier mammals (even the lightest squirrels are markedly heavier than a feeder’s worth of finches). You don’t have to worry about precision placement or purchasing extra hardware: you simply hang these feeders up and they work. These feeders also exclude the largest birds, such as crows or pigeons (jays are a borderline case and may often squeak under the weight limit). 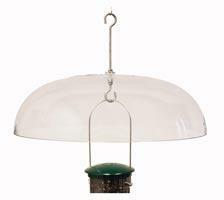 In addition to weight-sensitive models, more traditional caged feeders can also be found. These feeders are good if you also want to exclude larger birds such as jays from your feeder. The cages do obstruct views to some degree and may exclude desired birds such as jays, larger woodpeckers, or grosbeaks. The most popular feeder birds, such as house finches, goldfinches, titmice, and chickadees, will all comfortably enter the caged area. If you already have a Wild Birds Unlimited tube feeder, you can add a cage to convert it to a squirrel-proof feeder. 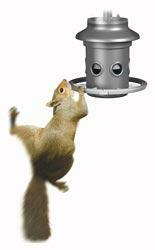 Squirrel-Proof feeders come in a variety of shapes, sizes, and prices. There are essentially two ways of protecting your existing feeders with external hardware: hanging them beneath a dome baffle, or hanging them from a pole fitted out with a pole-mounted baffle. Dome Baffles: Large, smooth domes cannot be crossed by squirrels. Smaller domes made as rain guards may not work as squirrel baffles, though they can be effective against smaller rodents. The major caveat to this approach is that it will not work if squirrels can access the feeder by jumping from the side (any tree branches or structures within 8–10 ft. are potential access routes): their only path to the feeder must be by climbing down from above. Visit us for more details and help choosing the best baffle for your feeders. Baffles can protect existing feeders, but require careful placement. Pole Baffles: If you hang your feeders from a freestanding pole, you can use a pole-mounted baffle to prevent squirrels from climbing up (poles without baffles are not squirrel-proof). If you have multiple feeders on one pole set-up, this can be a cost-effective solution since you only need a single baffle to protect all your feeders. As with dome baffles you must have a minimum of 8–10 ft. of clearance on all sides of the pole. The main ingredient in any quality bird seed blend is sunflower, which squirrels find delectable. Straight safflower seed can be used as a sunflower alternative which squirrels generally will not eat, but it is somewhat less attractive to some birds and is not available in shelled, no-mess varieties. 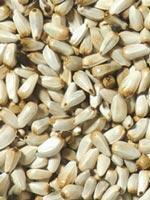 Nyjer seed will not attract squirrels, but is only eaten by a limited number of bird species, most notably goldfinches. 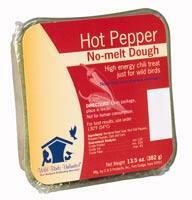 The addition of hot pepper to bird food will deter squirrels without any effect on birds. You can mix a liquid hot pepper “sauce” into your loose seed, or drizzle or spritz it onto just about anything, but this product still adds some extra hassle to filling your feeders. (It may not be necessary to treat your food every time it is used—squirrels will learn after their first hot pepper experience to not treat your birdfeeder as a restaurant—at least for a while.) Easier ways to achieve the same effect are to purchase ready to use hot pepper suet cakes or seed cylinders. Visit our Novato store for the best selection and prices of these and other specialty foods.